Hey, this is Andrea Brown. Transparency is a very important part of what I do here so I am disclosing that I’ve included certain products and links to those products on this site that I will earn an affiliate commission from. 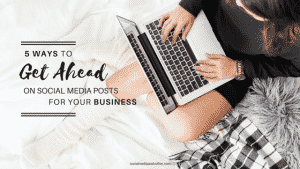 My goal with this blog is to help educate, and take the overwhelm out of social media marketing, but please understand I am doing this as a for-profit business and not just a hobby. Considering the number of articles on the site, it would be impractical to list each and every program that I have an affiliate agreement with. You should, therefore, assume that any links leading you to products or services are affiliate links which simply means that when you click on those links, I may be paid by the program without affecting your cost at all. I am also a participant in the Amazon Services LLC Associates Program, an affiliate advertising program designed to provide a means for sites to earn advertising fees by advertising and linking to Amazon.com and affiliated sites. That being said, there are plenty of products and services that relate to social media marketing, blogging, and making real-life more simple but I only promote the products that I have investigated and feel deliver value to you. Some of these affiliate relationships include: Haute Stock, Living Well Planner, Plan to Eat, Amazon.com, Focus @ Will, and Tailwind, among many others. Please note that I have not been given any free products, services or anything else by these companies in exchange for mentioning them on the site. The only consideration is in the form of affiliate commissions or compensation when you click through my affiliate links. If you have any questions regarding the above, please reach out to me using the contact page. The information is provided by SocialMediaAndCoffee.com and while we endeavour to keep the information up to date and correct, we make no representations or warranties of any kind, express or implied, about the completeness, accuracy, reliability, suitability or availability with respect to the website or the information, products, services, or related graphics contained on the website for any purpose. Any reliance you place on such information is therefore strictly at your own risk. 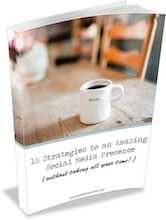 Through this website you are able to link to other websites which are not under the control of SocialMediaAndCoffee.com. We have no control over the nature, content and availability of those sites. The inclusion of any links does not necessarily imply a recommendation or endorse the views expressed within them. Every effort is made to keep the website up and running smoothly. However, SocialMediaAndCoffee.com takes no responsibility for, and will not be liable for, the website being temporarily unavailable due to technical issues beyond our control.